For your load of laundry to come out clean, your washing machine needs to spin and/or agitate properly. So what should you do when you discover that your washer won’t spin? Let us show you what to look for, and how to identify the source of the malfunction. Obviously, for your washing machine or any other appliance to work, it needs to be plugged in and powered on. If your washer won’t spin, it’s possible the power may have been disconnected. Even if your washer had power when you started it, the plug might have been knocked out of the socket, or the circuit breaker may have tripped mid-cycle. Check your unit’s power cord to make sure that it’s undamaged and securely plugged in. Also, make sure your circuit breaker for the washer is turned on. Not all homes have laundry rooms that are ideally set up for a washer and dryer, so some will plug their appliances in using an extension cord. Unfortunately, washing machines require a lot of power to run. Even heavy-duty extension cords can’t conduct enough electricity to power the wash motor which spins the tub. Move your washer closer to an outlet and plug it in directly with no extension cord, then try running it again. Balance is important when it comes to your spin cycle working correctly, and a unit that’s not level, or a load that’s unbalanced can be why your washer won’t spin. If your unit isn’t level with the ground, or if a load is off to one side of the tub, the spin function may not be able to reach high enough speeds. Make sure your garments are evenly-distributed around the tub. Then, use a carpenter’s level to check your washer and adjust the individual leveling legs as needed. Washer troubleshooting isn’t always about technical know-how. For instance, a front-load washer not spinning can be due to simply using the wrong detergent. Front-loader washers require you to use HE (high-efficiency) detergent only with low foaming action. Traditional detergents can produce too many suds, making the washer think it’s too full which stops spinning. Try using HE detergent with your front-loading washer to see if you can get it to start spinning and washing properly again. 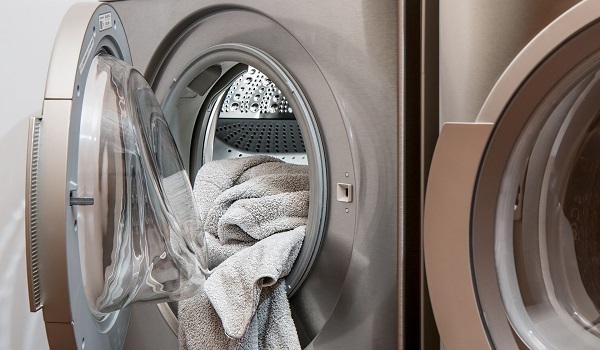 Still having trouble with your washing machine not working correctly? Call ABC Appliance Service today! Is Your Dryer Not Heating? This Might Be Why.